The adorable blue-eyed babies were discovered in a den in a remote area of the western end of the mountains, according to the Los Angeles Times. 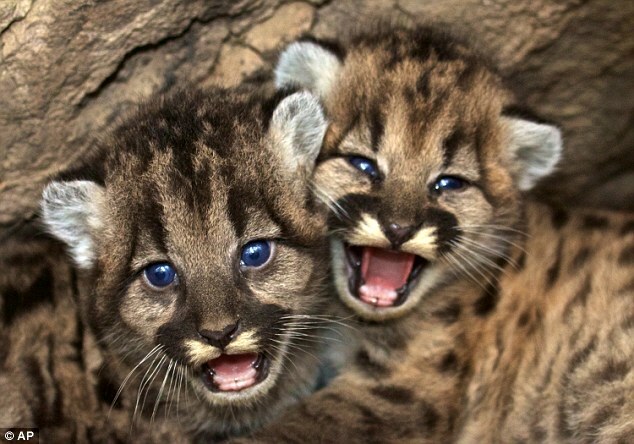 The female and male kittens have been named P-46 and P-47 by the National Park Service. Their mother, P-19, has been tracked for about five years. But trackers do not know who the daddy is this time - for her last two litters were fathered by her father - P-12. However, they don't believe he's the daddy this time as his movements haven't aligned with hers since March 2015. Biologist Jeff Sikich says the new babies are a good sign that the area is fertile ground for mountain lion breeding. but opening up the area would be even better to assist with healthy genetic diversity. As sweet as the kittens look, their chances of survival are still not that great. They have to avoid getting hit on a highway, exposure to rat poison - and worst of all - an adult male mountain lion, who may kill them. Responses to "Blue eyed babies! 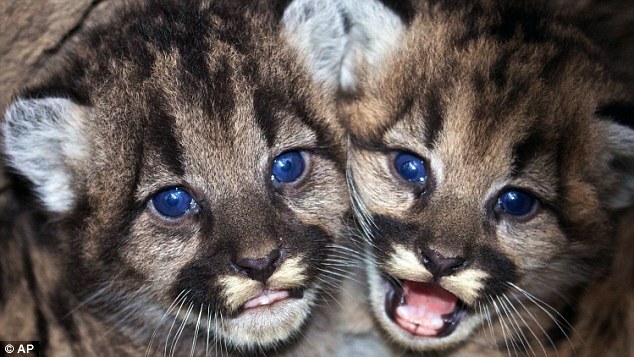 Two adorable mountain lions discovered in Santa Monica Mountains"